Make every drop count with art! The Otay Water District has launched its Student Poster Contest for kindergarten through sixth grade students attending schools located within the Otay Water District’s service area. Participants are encouraged to create a poster that reflects this year’s theme of “Water is Life” and demonstrate the importance of water-use efficiency inside and outside the home. The contest is a great opportunity for students to showcase their creativity while reflecting on their most precious resource – water – and the importance of using it as efficiently as possible in their daily lives. Click the image above to download the contest flyer and entry form. The District will judge the entries in two categories: K-3rd grade and 4th– 6th grade. A first, second, and third prize winner will be awarded from each category. Each of the six chosen participants will win a certificate with their name on it, gift card, art kit, and goodie bag. The two first place winners will also receive a prize (to be determined) for their entire class. The winners will be recognized at the District’s Board meeting in July and be featured in the District’s newsletter, on its website and social media platforms, and in other promotional materials. In addition, five out of the six winners will have their poster entered into the Metropolitan Water District of Southern California’s (based in Los Angeles) 2020 student calendar contest and traveling art show. To enter, participants must complete and sign the entry form (click here to download) and attach it to the back of their poster. Participants must have attended a school located within the boundaries of the Otay Water District’s service area within the months of March through June 2019. Click here to see a full list of schools located in the District’s service area. If you’re not in the District’s service area, other water districts may be participating. To locate your water district, click here and enter your school’s address. Entries must also follow the guidelines and criteria listed below. 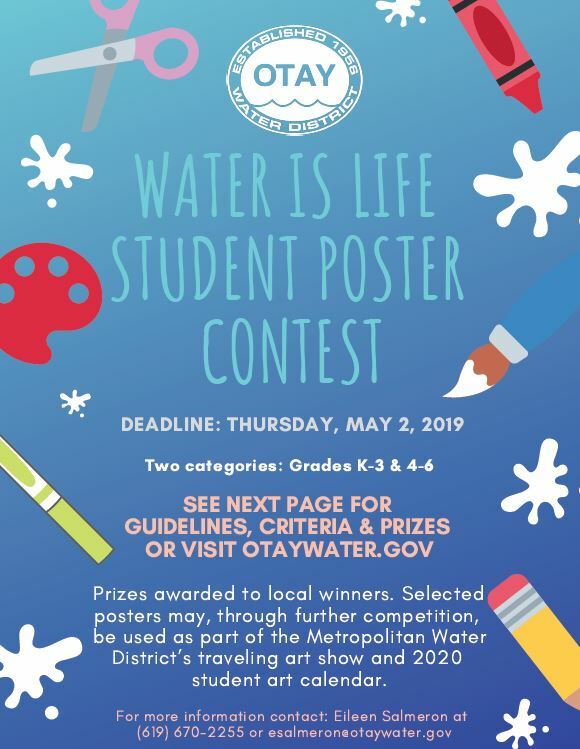 Deadline to enter the Otay Water District’s poster contest is Thursday, May 2, 2019. Posters should depict the theme “Water is Life,” which relates to water being used wisely inside and outside of the home, school, business, community, environment, agriculture, and/or in recreation. The theme of conservation and stewardship should be reflected in the artwork. The entry form MUST be completed, signed (by the parent or guardian), and attached to the back of each artwork. The contest is limited to grades K-6. All entries become the property of the Otay Water District and the Metropolitan Water District. The submission may or may not be returned. The agencies have the right to use any selected poster for the “Water is Life” student art calendar and for any other public relations use. Artwork MUST be drawn on 12” x 18” or 8.5”x11” WHITE drawing paper (no lines) or WHITE poster board. Under/oversized artwork WILL NOT be eligible. Artwork drawn on 12” X 18” paper must have AT LEAST a 1” blank border on ALL four sides. Posters MUST be drawn HORIZONTALLY (landscape orientation). A brief water message must be written on the artwork (“water is life” can be the message, but is not mandatory). The less text, the better. Words MUST be spelled correctly! Artwork must be original (no computer-generated, trademarked, or copyrighted images can be used, i.e. Snoopy, Sponge Bob, Dora the Explorer, etc.). No repeat artwork from past years. You can use crayons, paint, markers, ink, pencils, chalk, cut paper, or fabric. BRIGHT AND BRILLIANT colors are best! The Otay Water District will judge the posters in two categories: Grades K-3 and 4-6. Three top winners from each category will be chosen. The posters will be judged based on the selection criteria, including the theme, originality, and visual and word clarity. The Otay Water District reserves the right to question or disqualify any artwork that is clearly not the work of the student based on their age and grade level. 1st Place: $75-gift card, certificate, art set, and water-related goodie bag. Winner’s entire class will also receive a prize to be determined! 2nd Place: $50-gift card, certificate, art set, and water-related goodie bag. 3rd Place: $25-gift card, certificate, art set, and water-related goodie bag. Selected posters may, through further competition, be used as part of the Metropolitan Water District’s traveling art show, 2020 student art calendar, and in graphic arts materials.